Castle tours offer a great type of holiday. It might be just a simple day trip to tour a local castle which you can organise for yourself or at the other extreme a longer period of travel away from home with a special itinerary of castle tours organised for you by a travel company. Going on castle tours means you get to see incredible architecture, enjoy unique atmospheres and visit wonderful locations. The sense of history you can experience with castle tours is something special and for that reason many of us will undertake castle tours during our lifetime. Many Americans travel to Europe and beyond for their holidays and castle tours have become increasingly popular for many of them. Take Britain for instance where there is a wealth of history. It has hundreds of medieval castles spread out over the borders of England, Ireland, Scotland and Wales. Some are only ruins but many remain intact and offer a unique visitor experience - particularly those castles which have featured in significant historical events. 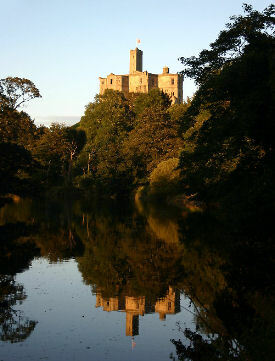 Photo: Warkworth Castle, England viewed from the river below. Hever Castle - England - the childhood home of Anne Boleyn, the second wife of King Henry VIII and mother of Queen Elizabeth I.
Dunluce Castle - N. Ireland - the ruins of this castle, some of which date back to the 1200's, enjoy a breathtaking setting - 100ft above the sea on a rocky promintary not far from the Giant's Causeway. The castle saw many historic battles in its lifetime and was featured in a Jackie Chan movie 'The Medallion' because of its dramatic location..
Skibo Castle - Scotland - renovated by American Andrew Carnegie in the early 1900's, reputed to be haunted. A marvellous piece of architecture in a romantic location (possibly why Madonna chose Skibo Castle as her wedding venue). Beaumaris Castle - Wales - the last castle to be built in Wales by Edward I (construction began 1295). Castles on the European mainland are another option for castle tours. France, Portugal and Spain have many medieval castles and Germany of course also has one of the greatest fantasy castles in the world - Neuschwanstein Castle. Although not medieval in age, its architecture and design have medieval leanings. King Ludwig II of Bavaria who built it had a passion for medieval legend and wanted to pay hommage to the medieval German knights' castles. No castle tour of Europe would be complete without a trip to see Neuschwanstein Castle! Castle tours are so popular today that whether you want to travel to Britain or the European mainland or indeed even further afield, you will be spoiled for choice by the options and travel packages on offer. At the other extreme, if you just want a good family day out then it's easy to organise your own trip. Browse medieval-castle.com and do a Castle Search to get some ideas or alternatively just do a search on Google.